Barcelona, 1957. It is Christmas, and Daniel Sempere and his wife, Bea, have much to celebrate. They have a beautiful new baby son named Julián, and their close friend Fermín Romero de Torres is about to be wed. But their joy is eclipsed when a mysterious stranger visits the Sempere bookshop and threatens to divulge a terrible secret that has been buried for two decades in the city’s dark past. 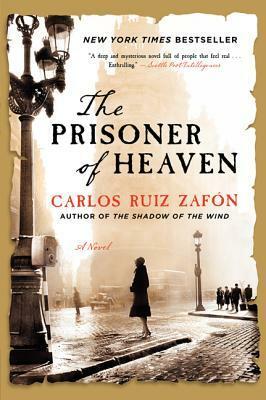 His appearance plunges Fermín and Daniel into a dangerous adventure that will take them back to the 1940s and the early days of Franco’s dictatorship. The terrifying events of that time launch them on a search for the truth that will put into peril everything they love, and will ultimately transform their lives. It was not as good as Shadow, but then how could any book we as good as shadow? That book was a masterpiece. This book just gave me questions and I should read book 1 and 2 again. First when something was mentioned, then I remembered that book 2 was about this guy Fermin meets in prison. Ok so I have obviously forgotten most things. The book can still be read as a stand alone, it's just that I know these people, and all the mysteries! It's one big evil puzzle. There are always new things throw at you, here we hear things about Daniel's mother Isabella, we meet David Martin again and most of all it's Fermin's story about the time he spent in prison. If I had the time I would re-read the books for sure. Because at the end, omg that evil ending, hints about more to come. So not cool. More things to come, which is good, and bad, cos that will take some time. The language was not as poetic, but in the end it was still a good haunting book filled with mysteries. This is the only one I've read, and through most of the book, I couldn't get hype behind the first two. I thought the book was okay, but didn't justify all the praise I had read about the first two books. Then I got to the end and I realized, I loved the book, and that I really need to read the first two. I still haven't read The Shadow of the Wind and it's one of my sister's favorites. Glad it had some good mystery even if not as good as the other. I read The Shadow of the Wind but didn't love it as much as everyone else, so haven't been anxious to pick up the others. I have been wanting to read Shadow of the Wind and it sounds like it is a book I would certainly appreciate if this author is well known for his gorgeous writing! Ok now I want to read Shadow of the Wind, and I like the concept of this series. I've never tried his books but I've heard good things about them. I still need to read The Shadow of the Wind! I really need to get going on this series, I'm super behind, and all my friends seem to love these books. Great review! Hmm, another series I've not tried. :) Sorry it wasn't as good as the first. Thank you. I haven't heard about these books but they intrigue me. I have the first book and the reason why I bought it was because of all the book bloggers saying how wonderful it was. I need to read it. I wonder if I read another in the series but in French... I'll have to look at the titles. I do love the sound of a haunting good mystery.....while I might pass on this one, you have convinced me I need to read book one! the cover and title are very interesting. Evil ending you say? Uh oh. Is it a monster cliffhanger? Those always destroy me! I feel like I'm missing something because I've never read this author! And you say Shadow is a masterpiece! I need to read this author, I have Shadow of the Wind. I loved Shadow of the Wind... I LOVED IT. I am going to visit my parents for two weeks coming up and I plan on reading books 2 and 3!! Sounds like I need to start from the beginning.